name comes from the fact that it occupies parts of Delaware, Maryland and Virginia. brethren. 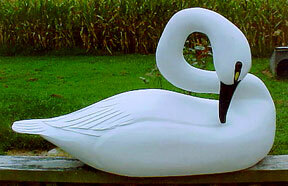 Floating sculpture waits seductively for visitors in the form of decoys carved by George Bell. George Bell was born on January 18, 1971 in Shelltown, Maryland, just eight miles east of Crisfield along Pocomoke Sound. His parents were divorced and Bell lived most of his life with his father, a truck driver. Bell started working on a crabbing boat when he was 14 years old. This allowed him to see wildfowl close up on the Chesapeake Bay. For his 15th birthday, somebody gave him a Do-A-Duck carving kit, which piqued his interest in making decoys. One day while on board, using an Exacto knife, he began to carve a mallard drake. The man he was crabbing with claimed it looked like the real thing. After Bell finished painting it, his partner paid $50 for the carving. George Bell was in the decoy business. About that time Bell met Grayson Chesser, a well-known decoy maker and hunting guide from the Eastern Shore of Virginia. Chesser had just finished carving a standing black duck that made a strong impression on this novice carver. Chesser began selling Bell’s carvings and took him to decoy shows. He also began using some of Bell’s decoys in his gunning rigs, along with decoys of his own, which provided additional advertising for his work. Bell made some customers in those early days that still come to him for decoys. It usually takes Bell about five days to carve and paint a dozen hunting decoys. A decorative carving can take up to three days alone. Typically it takes six months to a year to fill customer orders. His most ambitious undertaking was a full-sized standing eagle that sold for $1,000, but his decoys are available at much less expense. Besides attending shows and advertising in decoy publications, Bell has taken advantage of the Internet, especially ebay, as an avenue for marketing his decoys. "It’s a great way to reach customers I would never have met," he says. And they’ve sold to buyers from all over the land. Although the number of decoys he’s made has greatly increased, all of Bell’s carvings are made entirely by hand, one bird at a time, with each having its own unique characteristics. "I can look at a decoy I made years ago and tell you who bought it from me," Bell insists. There’s no reason to doubt him. For the complete story, please see the Sept./Oct. 2001 issue of Decoy Magazine.